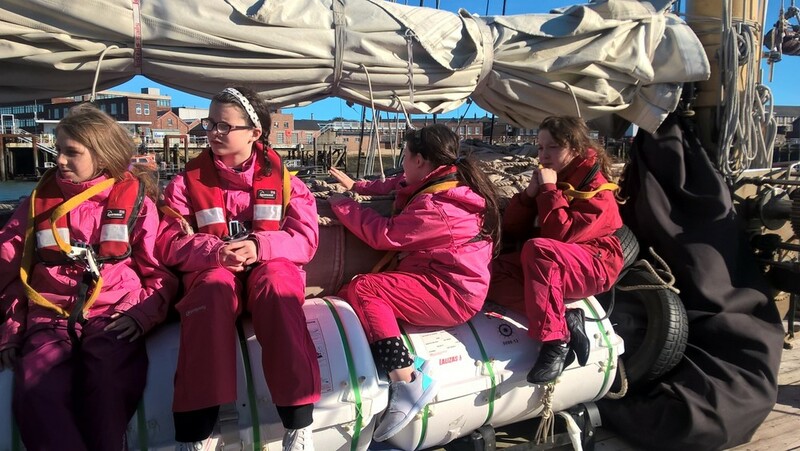 Four Year 6 girls from St. Cuthbert’s Primary School; Caoimhe Richards, Alex Rowe, Abby Rowe and Maddison Hardey along with four boys from SBSJ Jack Panter, Daniel Villanueva, Nathan Malonzo, Jayden Gutman too to the high seas on a sail training adventure in the south of England on The Solent and around the Isle of Wight. They will no doubt remember their experience of sailing a 70 year old tall ship on the Solent for the rest of their lives. All the students were an absolute credit to their schools; they were polite, hardworking, enthusiastic and very good company! Their adventure included sleeping four nights on the Maybe Tall Ship with one night at anchor near where Henry VIII’s prize tall ship the Mary Rose sank! All the students put their learning muscles to the test with resilience and teamwork coming top of the list! Over the four days they covered a wide range of subjects, including science, geography, numeracy, literacy, history, language, RE and citizenship, music and technology. They swabbed the deck, raised and lowered the sails, did chart work, kept a captain's log, plotted a course, took the helm, did knot work, climbed out on the bowsprit to the furthest point of the ship, learned to play the tin whistle, washed up, dried up and much more. All eight students can tell you anything you wish to know about the Mary Rose (Henry VIII's ship), how Admiral Nelson died and where, what life was like on a WW2 submarine, what it was like to be on an 18th Century warrior ship, and could compare a wooden tall ship to a modern sea cadets training ship. This experience has changed their lives and was also a most enjoyable experience – even with the odd queasy tummy! This experience marks the end of a two year project funded by St. Bede’s & St. Joseph’s, Bradford Council Youth Opportunities Fund and the Heritage Lottery Fund. It is hoped that the next stage will be even more exciting with the development of a school sailing club in 2016. Click here for More photographs on our Facebook page.